Nice work if you can get it . A potential future site of the Performing Arts Center at the Deutsche Bank building. A world-class cultural center planned for Ground Zero - and virtually abandoned for three years - is back on track and could rise on the site of the toxic Deutsche Bank tower, the Daily News has learned. The Performing Arts Center could be moved to 130 Liberty St. from a cramped site four blocks north, where it would have been shoehorned between the Freedom Tower and the transportation hub, planners say. Long the poor stepchild of World Trade Center redevelopment efforts, the revival of the PAC - a jewel in the original 2003 Daniel Libeskind master plan - would provide a rare burst of good news for the long-troubled site. The center would become the new home of the Joyce Theater, a modern dance company, and its 1,000-seat theater could provide a round-the-clock venue for a range of cultural offerings, including the Tribeca Film Festival. Moving the PAC could shave years off the timetable: The original site won't be available for six or seven years. But the Deutsche Bank is scheduled to be demolished by January. Before the recession hit, JPMorgan Chase was set to build a new home for its trading floors on the site. It scrapped those plans last year. The footprint of the two sites is roughly the same, and the arts center could be built atop the existing foundation of 130 Liberty St., say city and state officials who have been briefed on a preliminary state feasibility study. "Clearly, it's a site that could be ready a lot sooner - and the cost would be a lot cheaper - than the current site," Assembly Speaker Sheldon Silver said. The powerful Democrat, who represents lower Manhattan, cautioned that the proposal is in its infancy, City Hall and Albany would have to sign on and fund-raising has barely begun. "But there will be less funds to raise," he said. Joyce Theater Executive Director Linda Shelton added, "Terrific news for the arts - at last!" Obstacles abound: There is no schedule or budget for the PAC, no design sketches have been made public, no board has begun to tackle fund-raising. Although architect Frank Gehry was paid $4.5 million for "preliminary conceptual design work" it's unclear if he would design the whole building. Costs have been all over the map, with estimates ranging from $350 million to $700 million. No price tag for the new site has been released. Though private funds haven't been raised yet, the Lower Manhattan Development Corp. has squirreled away $60 million for the project. The agency had no comment. Port Authority Executive Director Chris Ward, who briefed community leaders on the plan, was described as receptive. "We're certainly willing to consider all thoughtful ideas for the site," said Stephen Sigmund, the agency's chief spokesman. A spokesman for Mayor Bloomberg said it was premature to comment. Perhaps it should be residential on that site? A Mixed-Use building. If not then the office space could go into a new tower built above the PAC. I think one of the reasons the PAC on 5WTC's site is beneficial is because they wouldnt require the new foundations, etc so building it in the base of a building would be less of a plus. It would also prevent a stream of black limos, cabs, cars, and loading docks in such close proximity to WTC Tower #1. The bunker needs to remain isolated. Does the Joyce plan to operate the Chelsea site and this one or will it dump the site on 8th? That's a good question. It would seem that the Joyce Theater in Chelsea would become a prime site for development, if the Joyce got a new home at the WTC. I'm under the impression that the Chelsea location would close. Putting a free-standing PAC at the DB site must be lovely news to the W crew. I agree. I don't like the Joyce's building. It might be nicer if they added windows to the facade, but it looks too much like a fortress. Last edited by londonlawyer; July 19th, 2009 at 10:04 AM. I think it was originally a grocery. 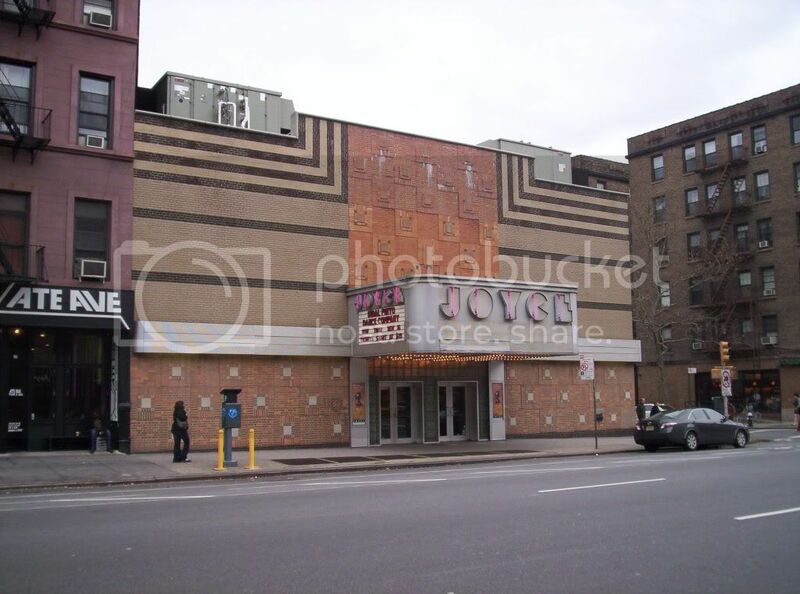 The Joyce Theater was formerly the Elgin Theater, a 1941 movie house, but the building required a major renovation to create an elegant, intimate home for dance in New York City. The Elgin was originally a revival movie house that was closed by the community when it became a pornographic movie theater. But it is a fantastic venue for dance. I would imagine that a brand new facility would be even better though -- especially since the Joyce wasn't built as a dance theatre. Last edited by londonlawyer; July 19th, 2009 at 11:54 AM. As far as I'm concerned, the WTC PAC is ground because look how damn long it's taking to get this eyesore removed! Three months after rebuilding officials floated moving the World Trade Center performing arts center to the site of the former Deutsche Bank building, the move looks unlikely to happen. The move would have allowed construction on the PAC to begin as soon as next year. In contrast, the current site for the PAC, at Greenwich and Vesey Sts., will not be free until at least 2014, meaning the PAC wouldn’t be able to open until around 2017. But although the PAC move gained tentative support in the community, changing any piece of the 16-acre World Trade Center puzzle is fraught with political, financial and engineering complications. Most significantly, if the performing arts center (or any other structure, for that matter) is ever going to be built at Greenwich and Vesey Sts., then the construction of the belowground supports needs to begin in the next few months. The reason for the tight timeline is that the Port Authority is doing its own belowground work in the same area starting early next year, necessitating the shutdown of some PATH train tracks. The supports for the performing arts center ought to be built at the same time, because this may be the only chance to work near the PATH tracks. “If we don’t take advantage of this opportunity, we believe it will be lost,” said Andrew Winters, director of the Mayor’s Office of Capital Projects. Since it is so important to build the supports for the PAC soon at Greenwich and Vesey Sts., Cultural Affairs Commissioner Kate Levin said now is not the time to think about moving the PAC somewhere else. Levin and Winters spoke Wednesday at a public hearing on the PAC, held by City Councilmember Alan Gerson. Another problem with moving the PAC to the Deutsche Bank site is that the Port Authority was supposed to get that site to build Tower 5. In exchange, the Port would set aside land to the north for the memorial and performing arts center. Renegotiating that agreement at this point could be difficult, Levin said. Still, the idea of putting the PAC on the Tower 5 site is not entirely dead. The Lower Manhattan Development Corp. has been studying the feasibility of the move and will have a report by the end of the year, L.M.D.C. President David Emil said. If the PAC site moved, it could be the base of a commercial or residential tower. The L.M.D.C. has committed $60 million to the PAC, of which about $8 million has been spent on planning and previous designs, but the arts center will need much more money to get off the ground. The PAC also needs a board or governance structure, along with a design (Frank Gehry will likely be the architect). Levin said Wednesday that it was too soon to start putting any of that in place, since the site will not be available until at least 2014. Two to three years before then, it will be time to finalize the design, board and fundraising, she said. Levin also provided details on plans for the PAC, which will be anchored by the Joyce Theater, a dance company. The PAC will contain: a 1,000-seat dance and performance facility, which Levin said the city does not have anywhere else; a smaller theater that could convert to a banquet hall; multipurpose rehearsal spaces; a cafe with a performance space, similar to Joe’s Pub; public spaces for lectures and community meetings; and programs on the ground floor to activate the streetscape. "...studying the feasibility..." We are nearly an entire decade removed from 9/11 and we are still.... "...studying the feasibility..." !!! If the PAC site moved, it could be the base of a commercial or residential tower. I mentioned this back when the big-belly Morgan Chase building was being considered. The PA would get revenue from site 5, and incentives could be offered to a developer in exchange for PAC funding.